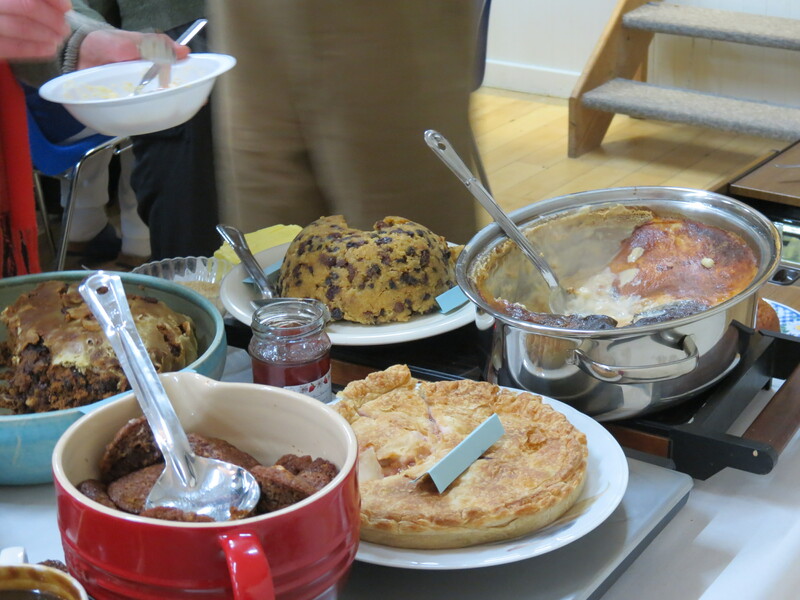 Post-Christmas diets were cast to the wind on Saturday night, during our most successful Pudding Night yet. 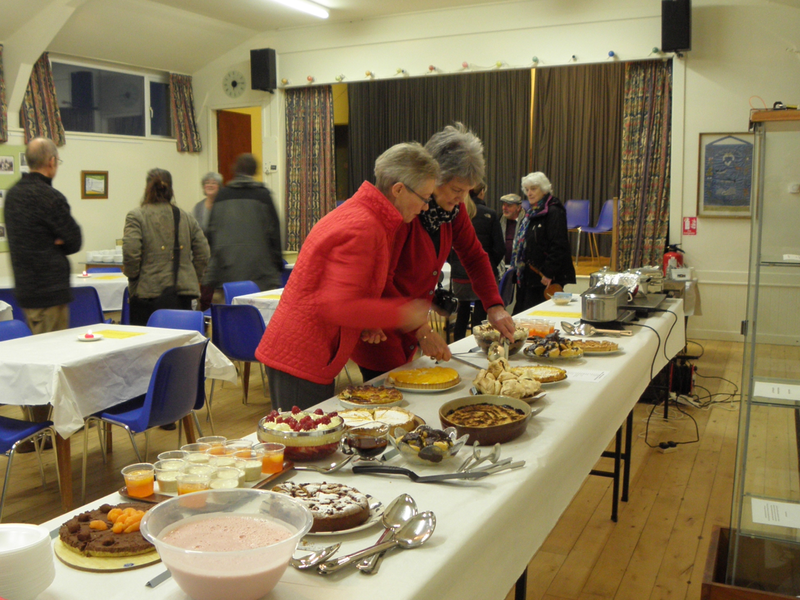 There was a real buzz in the village hall as groups of friends and neighbours arrived and extra tables were squeezed in at the last moment. 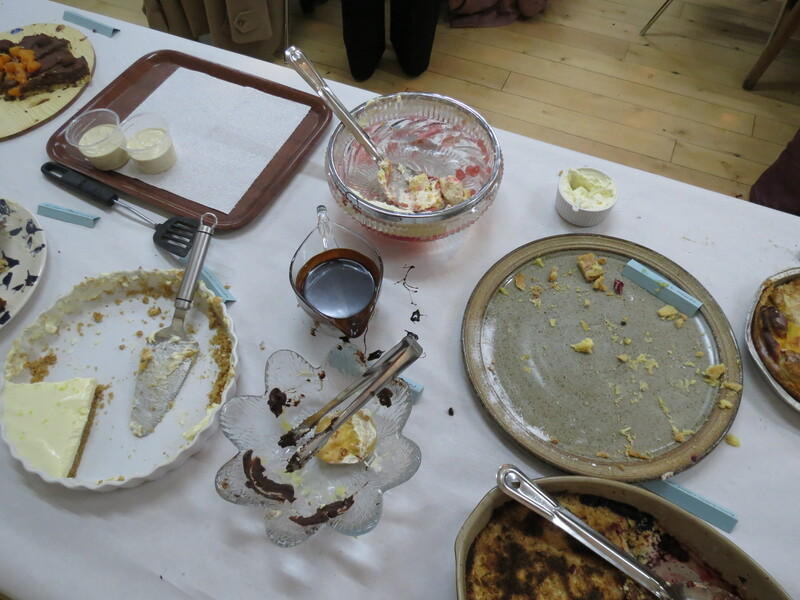 Just over 60 people came and set about the not inconsiderable task of demolishing 35 puddings. That works out at just over half a pudding per person! We suspect that some may have actually managed a little more than this – but hey, who’s counting? This is one night when over-indulgence is positively encouraged! You can get a sense of the great atmosphere in the Hall (and the enthusiasm of everybody!) from the short video clip below. Just click on it to watch it. The spread of food was quite fantastic. We had Tarts, Flans and Mousses. Various types of Trifles and Crumbles, Meringues, warm Treacle Pudding, Rice Pudding, Black Cap Pudding and the longest Jam Roly Poly ever! And many more, too numerous to mention. Live music was provided by Doug, Hilary, Audrey and Andrew – seen in the video below, in fine form. 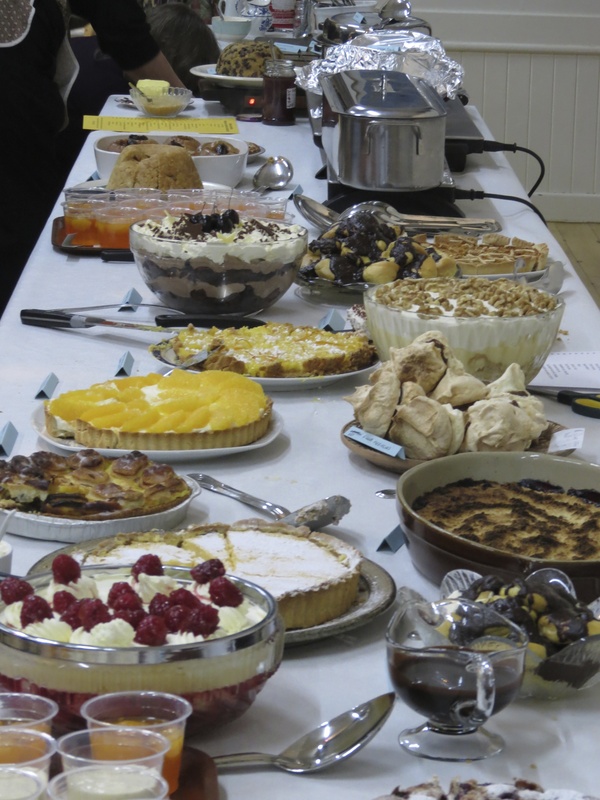 Many thanks to everyone who helped by baking, playing the music, setting the Hall up, serving, making teas and coffees, washing up, and then putting everything away – or by just coming along and making it such a good event. Here’s to Pudding Night 2016! And after all those calories, now it’s time for Tai Chi! Just a reminder that this week (25th) is the last week before a break of two weeks. Classes will resume on the 18th March, and apparently there are even more people interested in joining, so it’s looking like this will become a permanent fixture in the Hall. The FVA AGM will be held on Sat 14th March in the village hall at 4.30pm, and the first Coffee Morning of the year will be on Tuesday 17th March at 10.30am in the hall.